In 2015 I wrote an article on the legalities and practicalities of unmanned aircraft (or “drone”) operations at a racetrack. At that point, the law was in its infancy and drone operators were under strict limitations, particularly if they were hoping to be paid for their drone operations. A great deal has changed, and almost entirely for the better. Drone usage still breaks down into two broad categories – recreational and commercial. If you are being paid for drone services (and that means any means or form of payment, be it cash, barter parts, fuel or free track time) you fall into the commercial category. This is a basic decision tree to guide usage at a track (or other event). With that distinction drawn, let’s start with recreational users. The law has not changed much for recreational drone users since 2015. The FAA continues to defer to voluntary guidelines followed by model aircraft operators. 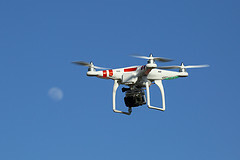 In addition to using common sense, recreational drone users need to be over 13 years of age, are expected to remain under 400 feet in altitude, to maintain line-of-sight contact with the drone, and to refrain from operation over people. One thing that did change is that the FAA requires all drones over 0.55 lbs. (recreational or commercial) to be registered. The FAA has provided a relatively easy method to do so. In addition to federal law, recreational users need to be aware of state law (which may restrict what you can do with your video and images) and the rules adopted by the track as well as the event’s host. As an example, West Virginia recently passed a law prohibiting publication of video or images of another person without that person’s consent. You are much more likely to have a visit from local law enforcement by breaking state and local laws than you are to meet the FAA, which does not have the manpower to enforce its laws against hundreds of thousands of drone users. Back in 2015, most tracks and event hosts (SCCA and NASA for example) went with a blanket ban on drone usage. There has been some relaxation of these rules, but given the possible consequences of a 5 pound drone impacting a high-speed vehicle, most venues still impose a ban. Most drone use at tracks is for promotional purposes. The FAA has passed regulations that create a clear roadmap for commercial operation of drones. You can find the regulations at 14 CFR Part 107; and the FAA’s web site does a great job of describing the various requirements and how to meet them. Most imaging uses of drones are now permitted. The FAA’s rules fall into three categories, pilot qualifications, drone requirements and operating rules. Pilots need to pass a knowledge test, and clear TSA review. The drone must be under 55 pounds and be registered. And operationally, the drone must: (a) operate solely in Class G airspace, (b) remain in visual line-of-sight with the pilot, (c) fly under 400 feet, (d) fly only in daylight, (e) remain under 100 mph, (f) yield to all managed aircraft, (g) not fly over people who are not participating in the mission, and (h) not fly from a moving vehicle. Many of the above parameters may be waived by the FAA by application and a showing that sufficient precautions will be taken to justify the waiver. As with recreational users, a commercial user is subject to state and local laws and to the rules imposed by the track and the sponsor of the event. Being legal in the eyes of the FAA does not absolve you from state and local laws and track/ sponsor rules. As noted above, most tracks and sponsors still have a general “no drones” policy that they will waive under appropriate conditions. There are many good reasons to permit drone usage on track premises, and the law is now fairly clear for both recreational and commercial use. If you are considering allowing drones, you need to work with your insurance advisor. Your current insurance may need to be upgraded, and you will be advised to require any commercial operator to show adequate insurance before they work at your event. If you choose to allow track visitors to use drones recreationally (for example, after hours) you will want to add language to the standard waiver putting compliance obligations on them. As an event sponsor, you first need clearance from the track, and then you will have the same insurance considerations as the track for operations you authorize. 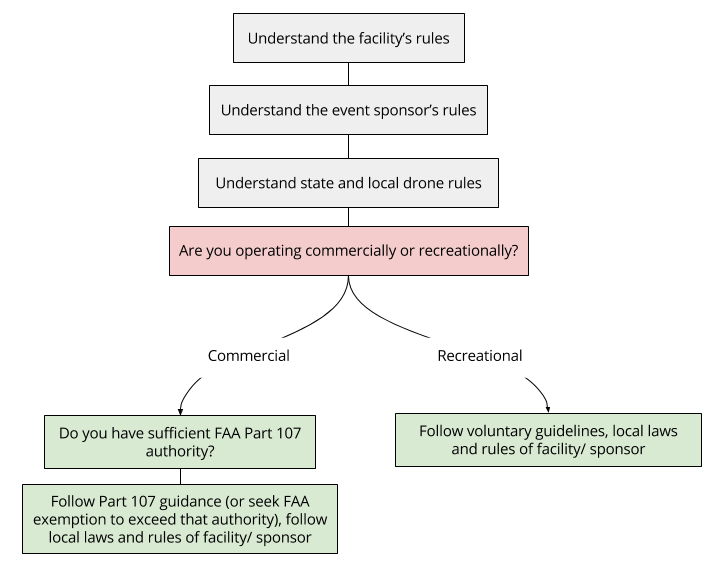 As with the commercial and recreational users, you must cover all bases – federal (FAA) law, state law, local law, and rules imposed by the property.